THE Tai Thong mooncakes are enhanced with a touch of Japanese influence this year. Well-known ingredients from the Land of the Rising Sun are used to create eight new flavours fresh on the market, among them matcha (powdered green tea), Fuji apple, Tokachi red bean and wasabi. 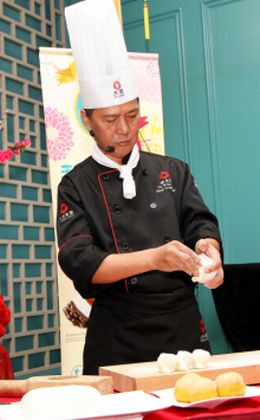 Group executive mooncake chef Yiu Wing Keung had carefully paired the ingredients so that they complement each others’ flavours while offering diners a new culinary experience. One of the most eye-catching variant — Cheesy Snow Skin Durian Infusion with Hokkaido Cheese — exemplifies this. “We made a bold attempt by pairing these two strong-tasting ingredients together, with the right amount of each, neither of the flavours is overpowering,” Yiu said. 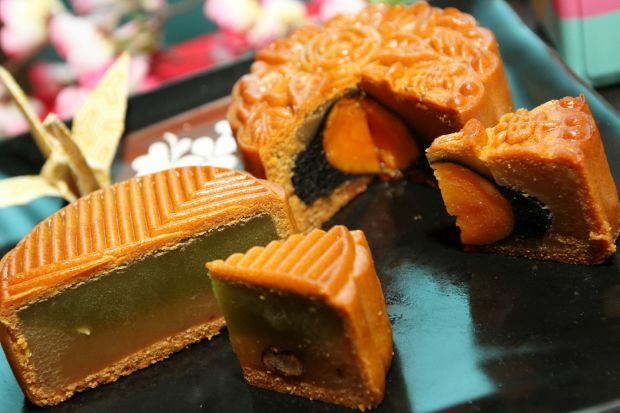 The mooncake is an indulgent dessert as the paste is smooth and creamy, but not too cloying. Other snow skin options are Peanut Snow Skin Okinawan Sweet Potato with Kuri Chestnut, Black Sesame Snow Skin Japanese Gourmet Coffee with Ground Almond and Chestnut Snow Skin White Lotus with Tokachi Red Beans and Kuri Chestnut. “We steam the snow skin beforehand, thus the texture is firmer,” Yiu noted. The Japanese flair also makes its way into the baked skin versions. Wasabi Lotus with Wakame Seaweed will probably be the most eye-catching variant, and the pungent ingredient actually makes a great dessert. The famous combination of green tea and red bean works well for mooncake, too, as shown by the Imperial Matcha Lotus with Tokachi Red Beans variant. Black Sesame White Lotus Single Yolk offers some traditional flavours, and the aroma of black sesame is a draw. Show of dexterity: Yiu demonstrating how he makes the Japanese-inspired mooncakes. If you are in for some fruity flavours, do try out Fuji Apple and Violet Lotus with Pumpkin Seeds. “We kept the sugar content in our mooncakes to a minimum without compromising on the taste and aroma. “This is in line with the Health Ministry’s efforts to encourage Malaysians to reduce their sugar intake,” he added. The delicate mooncakes come with beautiful boxes. In line with the Japanese theme, the two-piece and four-piece mooncake boxes are adorned with origami birds said to bring good luck. They are available in auspicious colours, red for joy and good fortune; green for health and harmony; yellow for warmth and promise of a brand new day while purple for wealth and grace. The Japanese-inspired mooncakes retail at RM16 each. A limited edition mooncake gift box (RM118) consisting of six Tai Thong mooncakes is also available. Tai Thong is also launching an online “Share & Win” contest from now until Sep 22, where participants receive points for posting about the mooncakes on popular social networking platforms.